I was invited to attend An English Sparkling Masterclass at The Spirit Of Christmas this year where 800 independent boutique retailers and design makers sell their wares, so if you’re really organised then you can do all your Christmas shopping there, often at discount prices. It is now impossible to miss the growing publicity and excitement around English Sparkling wine as the quality of the wine made here is starting to rival some of the very best from Champagne. The masterclass given by Richard and Kirsty Goring from the Wiston Estate Vineyard was very insightful and helped demystify some of the common misconceptions about sparkling wine such as the relationship between price tag and production method, (what does ‘traditional method’ mean on sparkling wine labels anyway?) and what is the difference between English Sparkling Wine and fizz from other parts of the world? We were first shown a short film of the story behind their success and it’s a really lovely story. 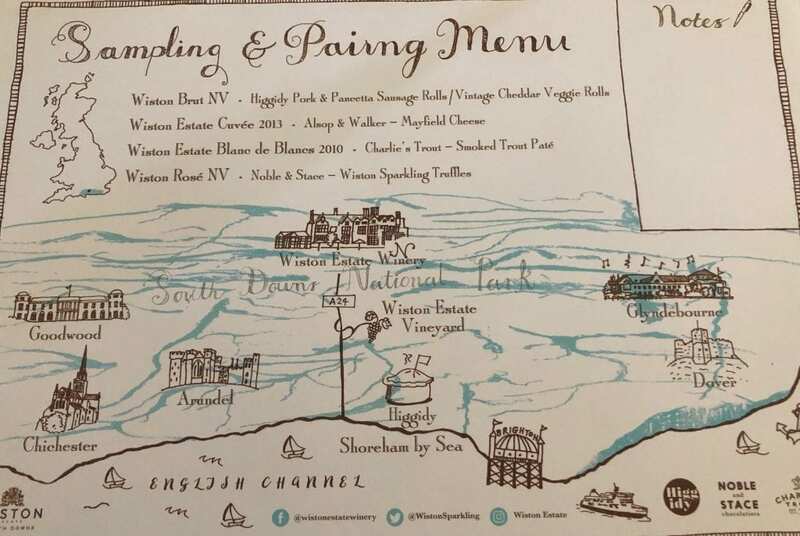 The Wiston Estate has been owned and managed by the Goring family since 1743 but it was not until the arrival of Harry Goring’s South African wife, Pip, who was homesick and cold that the idea of planting a vineyard took hold. Ever since arriving on the Wiston Estate in 1972, Pip spoke of her dream and passion to plant vines on the estate’s chalky south-facing slopes, (reminiscent of the geology of Champagne’s Cote de Blancs), in the heart of the South Downs in Sussex. It took her 32 years to persuade her husband to plant vines amongst their 6,000 acre estate. Harry Goring is quoted as saying “no one seemed particularly interested in hundreds of acres of barley and wheat but plant 16 acres of vineyard and people are fascinated.” Richard Goring describes his father as “the brake” and his mother as “the accelerator.” She seems to be the one who is all about celebrating most days of the week. Perfect! 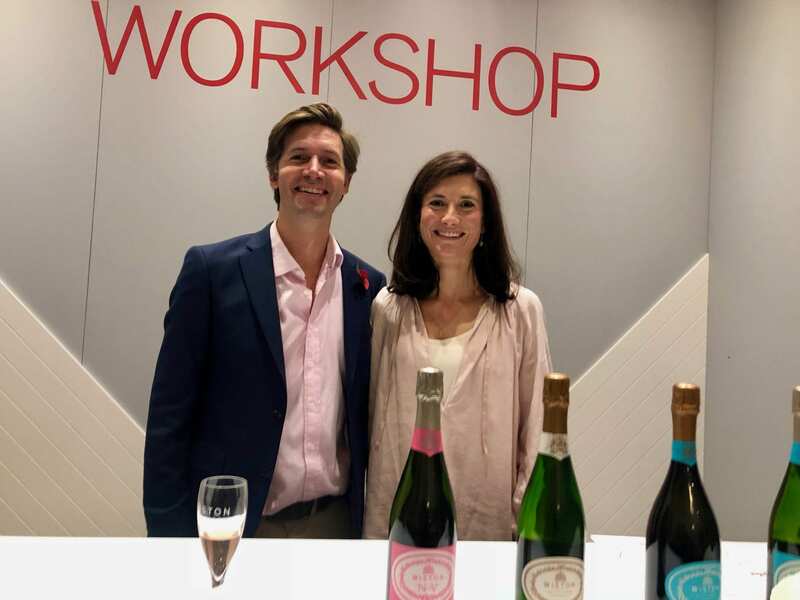 Richard and Kirsty Goring are the current custodians of the estate and they very generously shared their Wiston’s range of stunning multi-award winning sparkling wines, both vintage and non-vintage, Cuvées, Rosé and Blanc de Blancs. While their Blanc de Noir 2010 won ‘Supreme Champion’ in the official Wine GB awards, they are perhaps most proud of their current title as ‘Winery of the Year, 2018’ awarded by the same body. Kirsty did a very interesting interactive and insightful talk on how they produce their English Sparkling wines which was fascinating, whilst Richard filled up all our glasses, which might have been part of the reason why I ended up falling off the stage backwards at the end of their session whilst I was talking to them, which wasn’t really the impression I was hoping to give. 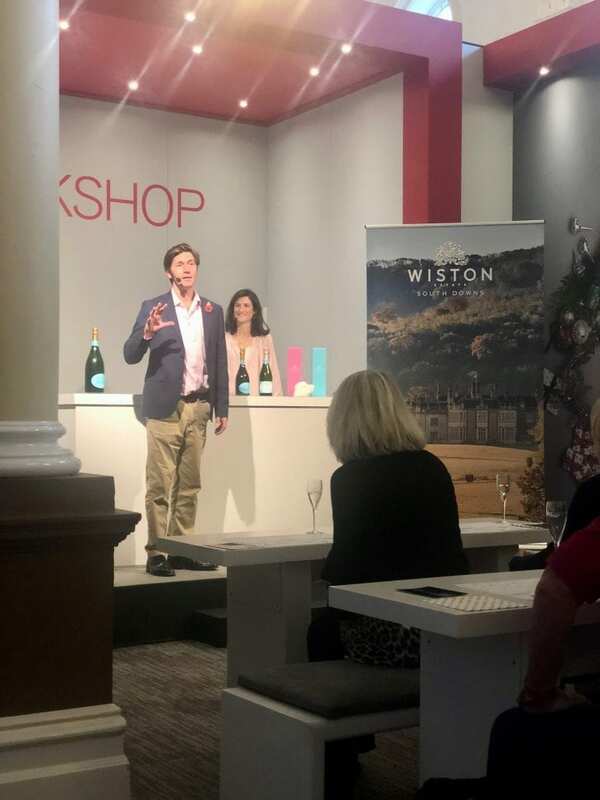 First we tried their Wiston Brut, NV – house style, non vintage, which Kirsty explained was a blend of years to create a consistent zesty, zingy flavour which they paired with sausage rolls – chefs look to simply activate the palate so you can pair it with almost anything. It’s very dry. Next we tried their Wiston Estate Curvée with some cheese – their vintage wine with apple and apricot flavours. Then the Wiston Estate Blanc de Blancs with some trout paté, made from 100% Chardonnay grapes and lovely with fish. Finally came my favourite, the Wiston Rosé NV, paired with a delicious handmade sparkling truffle. Wow Pip!! Amazing! Good for you!! You are such a star and so deserve every blessing! Merry Christmas!